I’m getting ready to start graduate school. I’ve been putting it off for years, but things have finally clicked into place and away I am about to go. I received my first syllabus tonight. The first book that I have to have read (by the first class, yay grad school!) is Jane Eyre. That’s easy enough, it’s not like I haven’t already read it several times, so it will just be a matter of rereading it and giving it a more “critical” look. One of the things I love most about this story is that Jane Eyre thinks she has a brush with a piece of folklore. Jane Eyre has an encounter with a Gytrash…at least she thinks she does. In reality, this is the scene where she meets Mr. Rochester, her mysterious employer and the hero (anti-hero possibly? ), for the first time. The Gytrash falls into that category of spirits that haunt lonely roads and weary travelers. Usually appearing as a horse, a dog or sometimes a mule, the Gytrash can either be helpful or harmful. Jane Eyre is not the only famous piece of literature to depict a Gytrash. The legend of a Gytrash also shows up in Arthur Conan Doyle’s The Hound of the Baskervilles nearly 60 years later. There are many types of spirits like this that people would have been weary of meeting on a deserted country road. We’ve all heard of the Will-O-the-Wisp, which are present even in American folklore. The Bridgewater Triangle in Massachusetts is famous for sightings. They even come up in children’s movies these days! Kelpies and Pukas are also similar to the Gytrash. These water horses can bring good or bad fortune to whoever they encounter. The Puka is known for showing up as a horse, a goat or a rabbit. It is usually associated with Samhain, since it was known for demanding an offering from the last harvested crops. Without the offering, they would cause trouble for the whole community. The Puka can also speak with a human voice and was known for trying to tempt people to come out of their houses at night. (The Puka is also a character in one of my favorite novels, Peter S. Beagle’s Tamsin. If you’re interested in British folklore this is a great book to check out). Kelpies could appear as beautiful women who would lure men to their watery deaths. The Kelpie usually liked to eat its victims. Sometimes also appearing as a horse, it would tempt someone to get on it’s back and then ride them into a body of water where they could drown and devour their victim. One of the more famous stories of the Kelpie was about one who had convinced nine friends to get on its back. The tenth refused, but put his hand on the Kelpie’s nose. 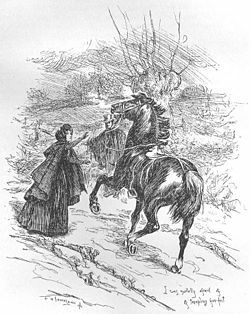 The hand became stuck there and instead of getting on the horses back as the others had done, the tenth child cut off his hand and escaped. 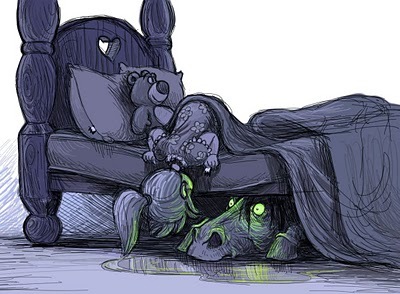 There are also many stories of Kelpies kidnapping women to be their wives in their watery homes which were usually at the bottom of the local loch. (As I write this, my partner is at GenCon without me. This year their guest of honor is another one of my favorite authors…Mercedes Lackey. One of Lackey’s less well-known works is The River’s Gift, a story about a Kelpie. I also recommend this book). These types of creatures are also related to the Mari Lwyd. 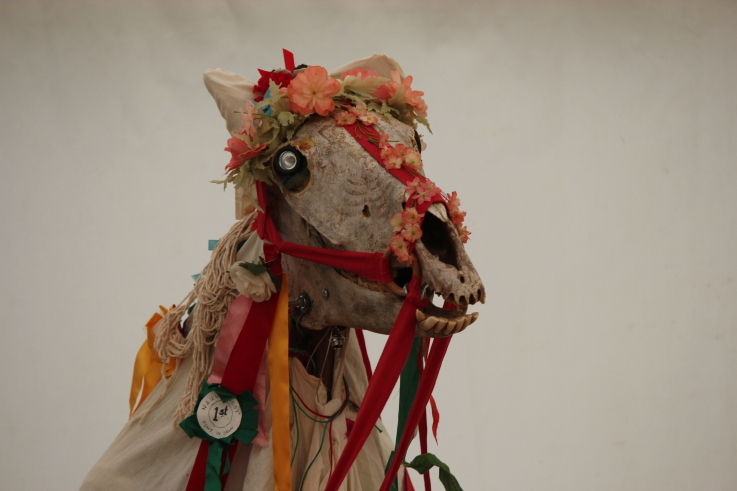 The Mari Lwyd or the Grey Mare is a Welsh tradition. Men would carry a horses skull (usually made out of wood or cardboard), decked out in a white sheet (that disguised the man carrying it), ribbons, and a hinged jaw that could snap at people door to door as they wassailed the new year in. Unlike England, where the focus of the wassail ritual was on the birds and the crops, the Welsh focused on the Mari Lwyd, which was a tradition that connects back to the goddess Rhiannon. 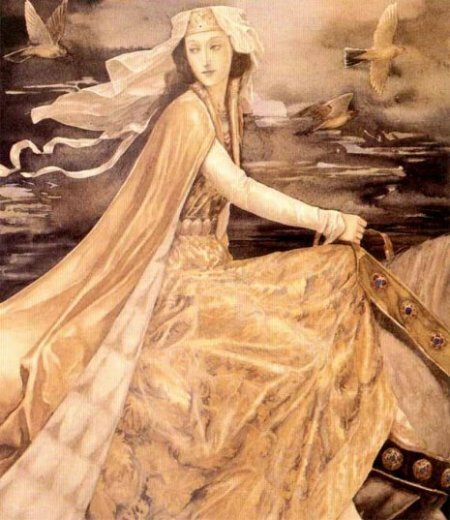 We meet Rhiannon in the Mabinogion. Rhiannon is an underworld woman who appears to the hero Pwyll on top of a fairy mound riding a horse. After they are married (which is a long story in and of itself), she is accused of eating her newborn son. In recompense she has to bear men on her back like a horse and tell them what she has done. The penance that was put on her was as follows: she was to stay at the court of Arbeth for the duration of seven years. There was a mounting-block by the gate. She had to sit beside it every day telling anyone coming by the whole story (of those she supposed did not know it) and offering whichever guest and stranger would allow themselves to carried, to be carried on her back to the court. But only rarely did anyone allow the carrying. In this way she passed the next part of the year. And while Rhiannon’s son is eventually returned and all is well, it seems as though Rhiannon has to go through her own initiation to lose her underworld nature and does so in this way. Rhiannon is also usually known for embodying an example of the idea of Celtic sovereignty. Rhiannon represents the land, Pwyll has to marry her to have the right to rule over the land. The book Women of the Celts discusses this idea at length if you’re interested in that.